The Ireland squad at Stade de France yesterday. IT’S UNLIKELY TO feature in a list of the top 10 biggest controversies in World Cup history, but France manager Didier Deschamps has been dealing with a fall-out since revealing his squad for next month’s finals. While Anthony Martial (Manchester United), Alexandre Lacazette (Arsenal) and Kingsley Coman (Bayern Munich) are notable absentees, there was a feeling of surprise from some quarters when Sevilla midfielder Steven N’Zonzi was included in the 23-man panel ahead of Paris Saint-Germain’s Adrien Rabiot. Most shocked by the omission was the man himself. 23-year-old Rabiot, who made 49 appearances in all competitions for the French treble-winners this term, reacted to the news by emailing Deschamps to inform him that he was rejecting a place on the standby list. In the weeks since then, there has been a verbal back and forth between the pair in the French media, with ex-players, coaches and the president of the French Football Federation all weighing in — overwhelmingly on the side of the 1998 World Cup-winning captain. Ahead of France’s warm-up match with Ireland at the Stade De France this evening, Deschamps was again quizzed on the topic during yesterday’s press conference, but simply batted the question away in one sentence by advising doubters to watch back Rabiot’s performances during his three international appearances over this past year. The sheer depth of their talent pool means there was always going to be big names left out, and while his selection decisions will no doubt be revisited if Les Blues — beaten finalists at Euro 2016 — underachieve in Russia, it is the type of problem Martin O’Neill would love to have given the severe lack of star quality in Ireland’s current group. Monday’s game will be played amidst significant unrest in France as thousands took to the streets at 160 locations around the country last Saturday to protest against President Emmanuel Macron’s plans for public-sector reforms that will result in mass lay-offs, while train strikes have been ongoing over the past month. 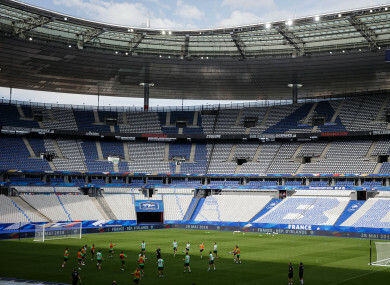 Irish fans flooded the cities of Paris, Bordeaux, Lille and Lyon two years ago and even earned a Uefa award for their behaviour, but a fun-sized band of supporters is expected to turn up in Saint-Denis on this occasion. An encouraging display and reason to hold some degree of optimism is what supporters will be looking to take away from the latest outing, while Saturday’s game against the US in Dublin is likely to be a celebration of one of the country’s finest servants as John O’Shea retires on his 118th appearance. Getting back to this evening, Ireland will need to be at the races to avoid heavy defeat, with a makeshift side set to line out from the start. The two real positives to come out of the loss to Turkey in March were Seamus Coleman’s return and a man-of-the-match performance from young Declan Rice, but that tells its own story as, overall, the team was one-paced, disjointed and difficult to watch. Lest we forget, O’Neill took a depleted squad Stateside for a series of summer games prior to the last World Cup, and met a Portuguese outfit completing their preparations for the tournament in Brazil. James McClean scored his first international goal that night in New Jersey, but the Boys in Green conceded five to Cristiano Ronaldo and Co.
Email “Letter from Paris: Deschamps standing firm in selection fall-out as under-strength Ireland return to Saint-Denis”. Feedback on “Letter from Paris: Deschamps standing firm in selection fall-out as under-strength Ireland return to Saint-Denis”.